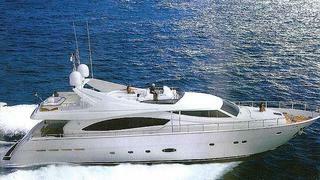 Jeff Stanley at Gilman Yachts tells me that he's just listed Ferretti's 26.8m motor yacht Princess Jules for sale. Delivered in 2005, this superyacht's twin 2,000hp MTU engines have clocked up only 500 hours use. The interior layout sleeps eight guests in four staterooms and there is accommodation for four crew. Princess Jules also features Mitsubishi gyro stabilisers and a Waverunner garage with a 'teak beach'. Her asking price is $4.1 million and she'll stay under cover in Fort Lauderdale until sold.